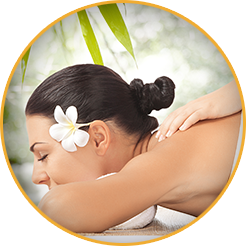 At Cheerfully Touch Thai Massage we work as a team of Massage Therapists who are dedicated to bringing you the best massage experience. All of our Massage Therapists have certificate and highly skilled and trained in the many aspects of massage and related modalities. We believe massage is a lifelong call and gift to heal the mind, body , Soul and spirit. Two or more therapists can be arranged for Couples and Groups! “I came last night and got a massage with my boyfriend. We were really happy. It felt so nice, it was one of the nicest massages I have ever had! Everyone was so friendly to. “I have been meaning to message you for sometime now. I have been going to your Bexley North location since it open and have been extremely pleased with the calm atmosphere created and the great Thai Oil Massage which I get regularly (either half hour or an hour) by the staff there. Over the past couple of months I have been tremendously pleased with the service and Thai Oil massage from your staff member Nuy. I personally found her massage perfect and identical each and every time I attend your service. Massage is truly a thoughtful gift, but it is one that will be remembered for a long time because there are few gifts that have such a lasting impact as an actual experience that is both enjoyable and therapeutic at the same time. 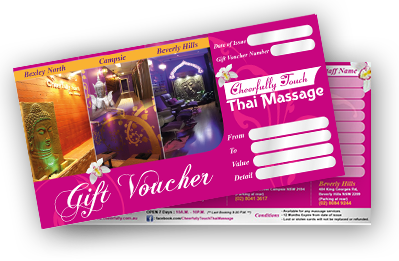 So if you are thinking of a gift idea that will make a positive impact on the one your are giving to, then a massage gift voucher should be high on your list of considerations. This card can use the point for discount 1 point = $1 If you collect minimum 10 points. This card can be use every branch of Cheerfully Touch Thai Massage.